Go on a medical mission with us. 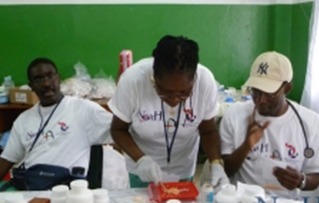 Medical mission trips with NOAH NY provide short-term volunteer opportunities for medical and dental professionals, students, and non-medical volunteers with any level of experience. Our medical and dental clinic provides free healthcare and health education. We make all arrangements for our volunteers including transportation, lodging, meals, permits, and clinic logistics. Equipment, supplies, and medicines to operate our clinic comes from donations through partnerships with hospitals, health and development organizations, volunteers and donations from private supporters. NOAH NY operates with less than 5% administrative and fundraising costs so more than 95 cents of every dollar donated is invested directly into our medical missions. Click below to register to go on a medical mission with us.